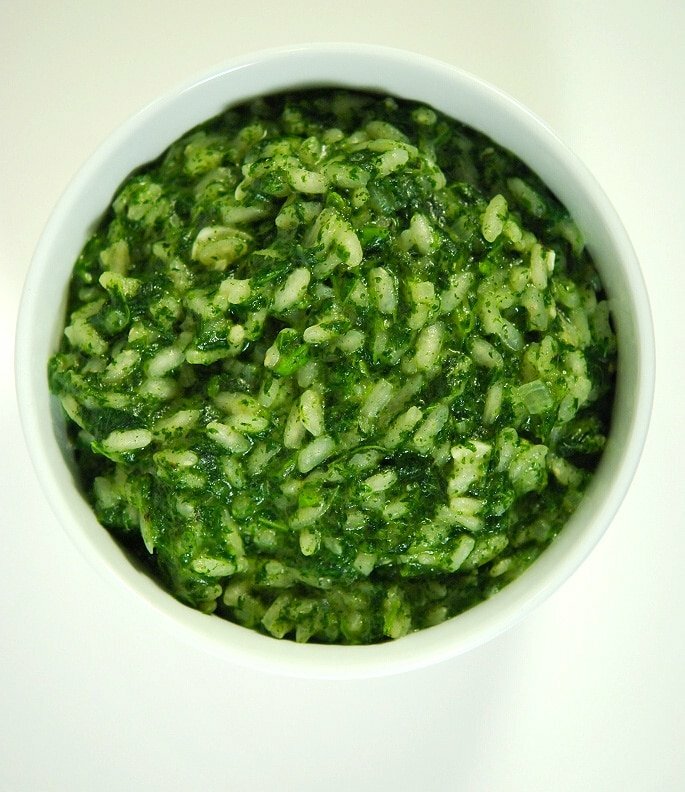 Stinging nettle risotto rocks. It is the essence of “green,” and is super healthy, too. What’s more, blanched nettles will keep their emerald loveliness even after a good 15 minutes of cooking, which makes this risotto visually stunning. The dish itself is pretty simple: Risotto rice, cooked nettles, butter, shallot, garlic, a little pecorino cheese and beef stock. The basic structure of this risotto holds with all sorts of variations. You could use a different grated cheese, such as parmigiano or a Greek mizithra. You can use onions instead of shallots. You can switch out the nettles for spinach or any other delicate-leafed green (orach, chard or herbs work well). You can even use vegetable or chicken stock if you must, although the flavor will not be the same. One thing you cannot switch out, however, is the rice. You absolutely must use short-grain rice to make risotto — long grain rice lacks the particular starch that sloughs off with constant stirring, and without it, you have no creaminess. No creaminess, no risotto. You can buy risotto rice in many supermarkets. You can use any spring green in this recipe. Nettles are the greenest, and most nutritious, but dandelions, spinach, curly dock, chard, amaranth or lamb's quarters are all good choices. Depending what variety your nettles are, you will need four or five big tong-fulls of fresh nettles to get your cup of cooked nettles. Regular nettles (urtica dioica) are more substantial than their daintier cousins, the dwarf nettle (urtica urens) and retain more of their volume when cooked. I say tong-fulls because you do not want to pick up fresh nettles, as they will sting you. Thus the name. Get a large pot of water boiling and add a handful of salt. Grab the nettles with tongs and put them into the boiling water. Stir around and boil for 1-2 minutes for dwarf nettles, about 5 minutes for regular nettles. Fish them out with a skimmer or the tongs and immediately dump them into a big bowl with ice water in it. Once they are cool, put them in a colander to drain. Get a cloth towel, like a tea towel, and put the nettles in it. Wrap one end of the towel one way, then the other end of the towel the other (like a candy wrapper) and squeeze out as much moisture as you can. Chop the nettles finely — don’t use a food processor or you will get a mush. The finer you chop, the smoother your risotto will be. Remove any stray stems. To make the risotto, heat 2 tablespoons of butter in a large saucier or heavy pot set on medium-high. Wait until the butter stops frothing and add the shallot. Cook for 2-3 minutes, stirring often. Add the garlic and the rice and stir to combine. Stirring constantly, cooked everything for a minute or so or until all the rice is well coated with butter. Add 1 teaspoon of salt and your first cup of beef stock and turn the heat to high. Stir it into the rice. When it starts boiling strongly, turn the heat down to medium and stir often, at least every minute or so, until the rice absorbs the stock. Repeat with a second cup of stock. When the second cup is absorbed, add the nettles and the third cup of stock. Stir well to combine. 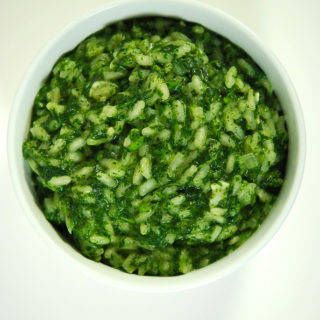 Keep stirring constantly now to develop the creaminess in the risotto, and to distribute the nettles evenly. Let the stock absorb. Taste the risotto, and add salt if needed. It may need that fourth cup of stock, as you want the dish to be loose, not firm. At any rate, you will need at least a little more stock to loosen the risotto for the cheese and the final tablespoon of butter, which you add now. Stir everything well and let the butter and cheese melt in the risotto for about 4 or 5 minutes, still stirring often. Serve at once. If you have leftovers, you can add the risotto to a beaten egg, form into patties or balls, roll in breadcrumbs and fry in olive oil. It is delicious.